In a statement Surrey Police said its officers and ambulance service paramedics attended the road works at the Runnymede Roundabout, Egham, in the early hours of Friday morning to reports that a man had been injured in a collision with plant machinery at the site. It added: ‘Sadly he passed away at the scene. His next of kin have been informed. 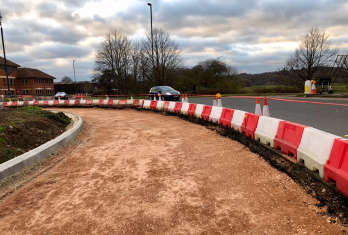 The works on Runnymede roundabout are being carried out on behalf of Surrey County Council but have been suspended until further notice. Colin Kemp, cabinet lead member for place, said: ‘My thoughts and those of everyone here at Surrey County Council are with this gentleman’s family and friends at this very difficult time. The main contractor on the site is Buckingham Group. In a statement, it said: 'It is with immense sadness and regret that we must confirm that a fatal accident took place during a night-shift at our Runnymede Roundabout project in the early hours of 1 June 2018. 'The accident is being investigated by the police, our directors and HSEQ team, and the specialist surfacing contractors, Toppesfield Ltd. The Health and Safety Executive has been fully notified of the circumstances. The A30 Runnymede Roundabout scheme involves improving the layout on all approaches to the roundabout and the roundabout itself. Works began in July 2017 and before the incident were scheduled for completion by the end of June.